Sure it's a big RELATIVE speedup - but it's still only 25MB/s from /dev/zero to /dev/null. What's the remaining bottleneck? 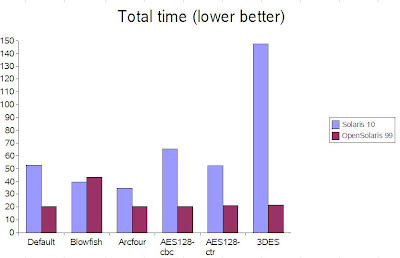 to Milek: the speed of Blowfish should be exactly the same since n2cp doesn't support it and in that case the OpenSSL implementation is used, as before. I see the same numbers during my tests. Maybe if you repeat it a few times it will converge there. to Anonymous: there are ways to speed it up - to precompute AES CTR stream in 64KB blocks, for example. For now, we didn't change the blocks sizes. More info is in my presentation. Also, you can see http://bugs.opensolaris.org/view_bug.do?bug_id=6749535.